Mulch has several uses in our gardens and our landscaping. It can be used decoratively and as a weed control measure, but it also helps control moisture and root temperature so the plants don’t have to adjust to drastic changes in the climate. In landscaping applications it is also used as a design element in addition to weed and moisture control. Many people think of it as more of a decorative feature in the yard. Yes, it can be attractive; however, it really does have specific purposes. In the spring and fall dark materials can be used to protect plants by keeping them warm. Conversely, light colored materials will keep them cooler during the hot summer months. Applying some around plants and trees in the garden or yard helps prevent weed growth and the need to remove them. It also helps plants retain water by slowing evaporation. Adding some to a slightly sloping area will also help prevent soil erosion. The question that should be going through your mind is not whether to mulch, but which type to use. We like to think of it as a time and labor saver. The late Ruth Stout, a frequent contributor to Organic Gardening magazine in the 1950's and 60's touted it as a way for older gardeners to be able to tend there gardens without digging using spoiled hay, wood chips or anything else she could get her hands on. Organic materials are considered more desirable because they will directly add organic content and some nutrients to the soil as they break down. Materials such as grass clippings, nut shells, and wood chips as well as shredded materials such as hay, straw, leaves, bark, pine needles, newspapers and cardboard can all be used. Also, if your have some readily available, well aged compost can be used is appreciated by plants. 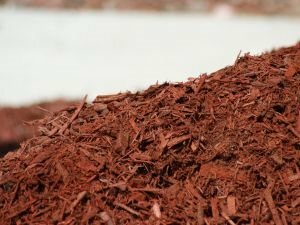 Organic mulches are usually piled quite high, about three to six inches or more, and will eventually settle over the season. One of our favorite combinations in the Crossroads garden is layers of newspaper covered with grass clippings, or just straight grass clippings. A caution is in order for a popular product. Cocoa bean shells, a by-product of chocolate production, are used for landscaping. Homeowners find it desirable because it degrades into an organic fertilizer and provides an attractive color and odor. This material, however, can cause methylxanthine toxicosis in dogs. Some dogs find the mulch attractive and eat small to large quantities, which can result in death. Non-organic materials that can be used include landscape fabric, plastic sheeting, ground rubber, rocks, and gravel. Plastic sheeting or weed control fabric can be spread on the soil in the garden or growing area and holes cut on the top so the plants grow through. The fabric or plastic is then covered with decorative material. Ground rubber mulch is a relatively new product made from recycled tires. Rocks and gravel can retain heat from sunlight and extend the growing season especially in northern states. No matter what you decide to use, it will make your gardening chores easier. Any weeds that do pop through the covering can be pulled easily. We just lay them on top of the grass clippings that we use in the vegetable garden or toss them in the compost pile.